Exquisite and delicate bronze four-light ceiling hall or entry lantern by Maison Baguès, Paris. Four delicate candle arms and four curved glass panels. French style attached wiring to arms. Fixture uses four 40 watt max candelabra base bulbs, newly wired. Bagues style number 16257 and is stamped on interior of some parts. 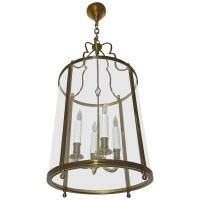 Overall height including chain and ceiling cap 33″ and can be adjusted to suit.